Despite the ongoing debate about “pinkwashing”–the misuse of the breast cancer pink ribbon–I seem to be surrounded by it. On my flight from San Francisco to North Carolina, I chatted with a flight attendant and her sister is going through treatment for breast cancer. 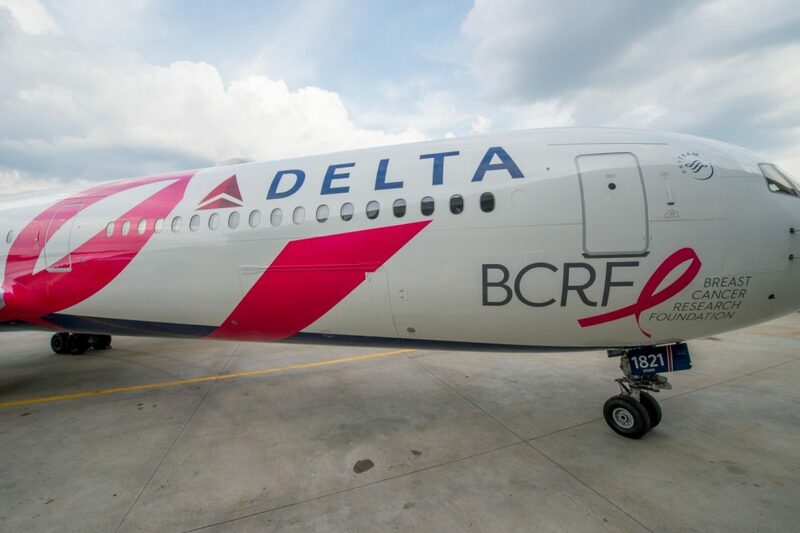 And as we landed at JFK, I looked out the window and there on the tarmac was a Delta jet swathed in a pink ribbon with a big Breast Cancer Research Foundation logo on the side. A few days later, getting my toes painted at the beach in North Carolina, the woman next to me starts chatting and it turns out she is a 20 year survivor. Finally, as the kids and I waited for a flight at La Guardia, my daughter nudged me and pointed to a pink suitcase with a pink ribbon. I turned to the woman standing next to the suitcase, patted her shoulder, and told her I was a survivor, too. And she said it was for her sister, another survivor. And we hugged. It is astonishing to me how quickly we can feel connected through what is such an ugly thing. It’s an ugly thing turned beautiful: beauty in the connection, in the solidarity, in keeping up the fight for women now and for our daughters, nieces, goddaughters, granddaughters. I’m heading out to explore Boston today and who knows who I might meet? I will keep my eyes open. Be well & enjoy these summer days!